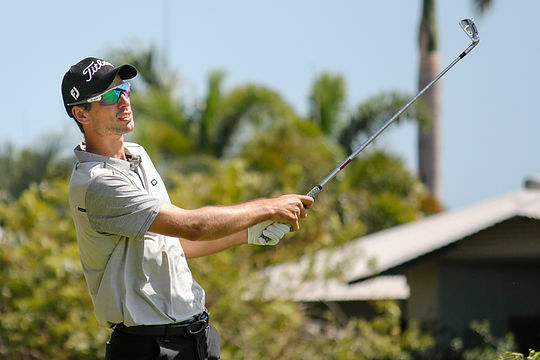 Jordan Zunic has left his mark on the Palmerston Golf Course in the first round of the Northern Territory PGA Championship. Teeing off the 10th, Zunic was slow to get started making the turn in just 1-under the card. However it was the front-9 where the 2015 New Zealand Open champion really ignited. He posted six birdies, four consecutively, on his way to firing 7-under 64. “It’s always nice to start off a tournament well. I was feeling really nice over the ball and managed to hole some putts. I am wrapt with the way I started,” said Zunic. The young gun was excited to see his hard work over the past few weeks paying off on his home tour; the ISPS HANDA PGA Tour of Australasia. “This country style golf course reminds me of the courses I used to play on when I was younger. Being from the South Coast, from Wollongong, we have a lot of courses that are short and tight like this one,” added Zunic, who has recently spent some time with his coach Warwick Dews, the PGA Pro at Cronulla. Since his win at the New Zealand Open in 2015, many opportunities have come up for the 24-year-old including playing in the WGC – Cadillac Championship where he had a practice round with World Number 1 Jason Day. “I have done a lot of travel this year. I have really enjoyed the chance to go and play in some really big tournaments on the European Tour,” added Zunic. While Zunic might be relaxing this afternoon, tomorrow in round two it will be back to business. He currently holds a two shot lead over South Australian Max McCardle who comes into the Northern Territory PGA Championship in top competition form. “I have had a bit of a break, so to be honest I haven’t been playing great the last couple of weeks. I spoke to my coach yesterday, I was hoping that getting back into tournament mode and getting the juices flowing again might put me in a good rhythm,” said McCardle, who has had four top-10 finishes on the PGA TOUR China so far this year. Sitting tied third on 4-under 67 are Queenslander Tim Hart and New South Welshman Jake Higginbottom. Rounding out the top-10 on 3-under the card are Darren Beck (QLD), Antonio Murdaca (SA), Michael Sim (WA), Mathew Perry (NZ), Kota Kagasaki (QLD), Deyen Lawson (VIC), Matt Millar (ACT) and Aaron Wilkin (QLD). The second round of the Northern Territory PGA Championship will tee off at Palmerston Golf Course at 7.30am with Jordan Zunic on course at 12.15pm.